Frequently Asked Questions | Norwest Construction Inc. Still have questions that are not listed below? Contact Us. Why should I consider asphalt for my paving needs? Asphalt is a cost effective alternative to concrete. Asphalt increases the appearance and value of your property. Because of its dark color, asphalt helps melt snow and ice during the winter months better than concrete. Why should I choose Norwest Construction Inc. to do my paving? Norwest Construction Inc. has been providing paving for over 33 years in the Northern Illinois and Southern Wisconsin areas. Norwest Construction Inc. is IDOT approved, fully insured, and experienced in road construction, parking lot construction, and drive way construction. We provide the correct equipment, materials, and experience to ensure your project is one that provides the best value for your dollar. How long will my new asphalt last? Properly installed asphalt that has been adequately maintained and cared for should last 25 to 30 years. Norwest Construction Inc. provides a written 1-year warranty on materials and workmanship from date of project completion. What is an 'overlay' and is it appropriate for my needs? An overlay is new asphalt paved over existing asphalt. A correctly installed overlay should consist of a minimum of 1.5 to 2 inches of new asphalt – anything less will not last. 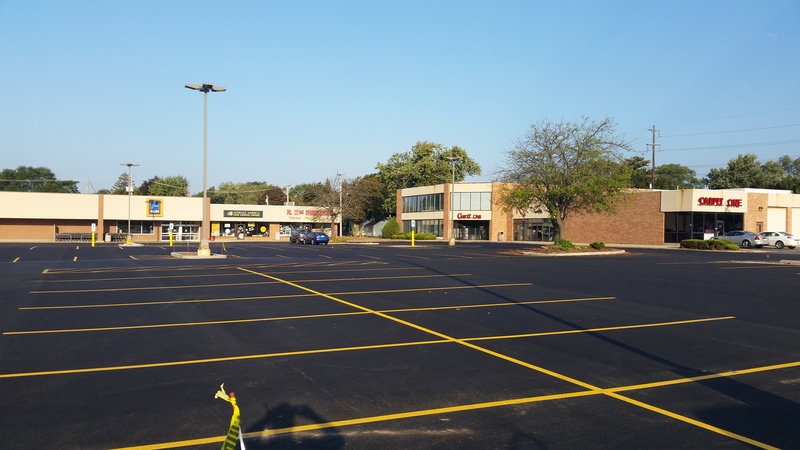 Overlays are economical alternatives to replacement in large parking lots. The condition of the existing asphalt and drainage issues come into play when considering an overlay, along with other factors. For this reason, the typical driveway may not offer the economy of scale to make an overlay cost effective. Our experienced estimators can help you with this determination. Contact us for a free estimate today. What is the typical procedure for installing new asphalt? Our preparation crew will come in to do the prep work, which may involve simply grading your existing gravel base, removing the old asphalt, or even excavation of grass and dirt for the installation of gravel. They will determine the grade with a level and/or transit to ensure proper drainage. Once the gravel is leveled off and compacted with our vibratory roller(s), we wait (usually a week) for the gravel to settle and harden before paving. This ensures that the aggregate base is at its highest strength to allow us to achieve maximum compaction of your new asphalt mat. What do I need to do when you come to pave? If the asphalt comes right up to the garage, the paving crew will need to be able to access the first 10 feet inside the garage so the roller can create a smooth transition between the garage floor and the asphalt. You may either leave the door open or indicate how the crew can gain entry. They will close and lock the door when they are finished. Your asphalt will be the most susceptible to damage for the first 6-12 months after it is installed. Avoid spilling any corrosive liquids on the asphalt (such as gasoline, transmission fluid, or oil), as they will cause damage to the asphalt. We recommend that you backfill the edges (build up the sides with black dirt) and then seed it. Do not drive or park the car on the asphalt for at least 24 hours after job completion (48 hours are recommended in very hot weather because it takes longer for the heat to escape the asphalt). You may walk on the asphalt right away, but objects with sharp edges or narrow points (i.e. kickstands, automobile jacks, ladders, etc.) should not be placed on the asphalt for the first 12 months unless you put a board or steel plate under the object to displace the weight to avoid causing an indentation in the asphalt. Assuming that the initial asphalt pavement was designed and constructed properly, the primary cause of failure is the penetration of water into the asphalt base. Oxidation of the pavement surface begins this process which causes the asphalt to dry and become brittle. This oxidation leads to the erosion of the top layer of fine particles, and the appearance of larger stones and small cracks on the surface. If left untreated, these cracks grow over time and eventually allow water to penetrate to the base of the pavement. In short, your asphalt pavement will fail because of AIR and WATER, unless you are proactive to maintain the surface and extend the life of the asphalt. If you want to keep your overall costs down, you will need to implement a plan to maintain your asphalt pavement before it has to be replaced! Sealcoat is a combination of water, mineral fillers, and emulsified colloid coal tar (or asphalt). Sealcoats are applied directly to an asphalt blacktop surface using a range of different tools including: a mechanical sprayer, broom, or squeegee. How does sealcoating help protect asphalt? Sealcoating functions as a barrier that seals the top of the blacktop. It protects asphalt from water, sun, and air which will damage the asphalt and cause it to deteriorate more rapidly. Sealcoating also improves the appearance of asphalt by darkening and smoothing it, making line painting and cleaning simple. Sealcoating should be done once the surface has oxidized after new asphalt is laid. Existing asphalt surfaces should not be sealed until the ground temperature is above 55 degrees Fahrenheit. Resealing may be necessary every 2-3 years as needed.